(1) Add a Category: To add a new category, select the `Add` button, then enter all the fields ( detailed below ) needed for the category. (2) Edit a Category: To edit a category, select the `Edit` link to the right of the category you wish to edit, then edit any fields needed for that category. (3) Delete a Category: To delete a category, select the `Delete` link to the right of the category you wish to delete, then confirm that you wish to delete it to remove it permanently. (4) Items: To view all items in a category, select the `Items` link to the right of the category. (6) Category Order: To change the order of a category here in the storeadmin and also in your site template's menu drag and drop the category to the position you want it to be in. (1) Category: Enter the name you wish to use for this category. This name will be displayed in the navigation list, as well as at the top of the category pages. (2) Parent Category ( optional ): If this category is to be a sub category, select the parent category (the category that this sub category will be listed under) from the drop down box. (4) Header Image ( optional ): If you wish to display an image at the top of the category place, in place of the category title, enter the URL of that image here. You may also click the `Upload` link to load an image to your site. 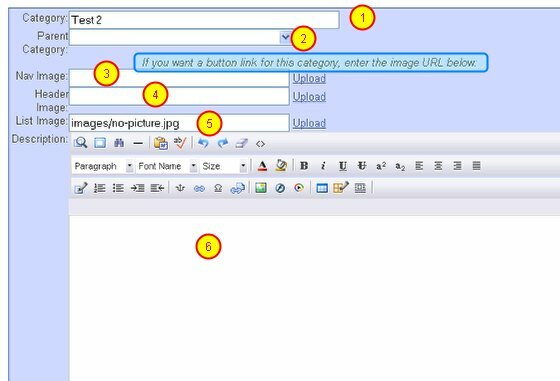 (5) List Image ( optional ): If you display a category list when a customer first views the catalog or index page, you can enter a list image to show an image in place of the category name in the list. The list image also displays in place of the category name for any sub category listing. Enter the URL of the list image here, or click the `Upload` link to load an image to your site. (6) Description: Enter the description that will appear under the category title or image on the category page. This description can include HTML coding if desired. Any HTML codes you enter will be stripped out and the description truncated when creating the category meta tags. (1) Keywords: Enter the keywords you wish to set for this category. This field only influences the keyword meta tags, and will not appear in the catalog. (2) Meta Title: The meta title for this pag. The meta title is what appears in the browser top most bar ( usually a blue bar ). If you leave this field blank, the system will use the default meta titles specified in the settings. o Single Product Layout: This displays all product details, including order buttons and quantity boxes, on the category page, with items displayed in a single column down the page. When customers click on a thumbnail (small) image, they will get a pop up window with a larger image, if one exists. Customers can order directly from this page. o Double/Triple Product Layout: This is the same display as the Single Product Layout, but with two or three products across each page. o Multi Column Layout: This displays just the thumbnail image, item name, and price on the category page. When a customer clicks on the image or item name, they will view all product details for that item, including a larger image if one exists, and will be able to purchase from this detail screen. (4) Active: Set this value to "Yes" if you wish to display the category on your site. If you set this value to "No", the category will not appear. However, it will still be set up in the administration area, and you can "turn it on" by changing the value to "Yes" in the future. This is helpful for holiday categories or catalog sections that you are temporarily restructuring. Turning off ( deactivating ) a category WILL NOT deactivate the items within the category. Those will still be available in searches and VIEW ALL ITEMS unless you also deactivate those.